The Road to the End of the World? The plan for Barcelona was basically to get a Visa-Entente covering Cote d’Ivoire, Burkina Faso, Benin, Togo and (just for completeness though I don’t intend going there) Niger. I had read reports that the Benin consulate in Barcelona was the place to go for this on ‘The Hubb’ – an invaluable resource. I even made an appointment! So I headed down to Spain along roads familiar from previous travels to the most convenient campsite North of Barcelona at El Masnou. I guess in summer it would have required booking early, but there was lots of space when I got there just in time for a beer before sunset overlooking the sparkling blue Mediterranean. A short walk and a train trip in the morning got me to the centre of Barcelona with lots of time to spare and I found the consulate in a small first floor office with no trouble. 20 minutes later I had my first 5 countries visas in my passport and was back out in the sunshine. Nice. I’m sure this will be balanced later on in the trip but I’ll take the good going for now! Success in getting the Visa-Entente so quickly and without any trouble meant I had a little time in Barcelona. First up I went to see how La Sagrada Familia has progressed since I was last here with Elena. I have to say its looking much more advanced – more balanced with the spires looking pretty much completed. Then, as I was feeling hungry and it was getting on for lunchtime I searched ‘vegan’ on google maps…and up popped a whole selection of vegan and vegan-friendly restaurants – this is an improvement on that previous visit where we wandered around trying to find something tasty and ended up with an apparently ready-made veggie paella…Elena would have been excited! 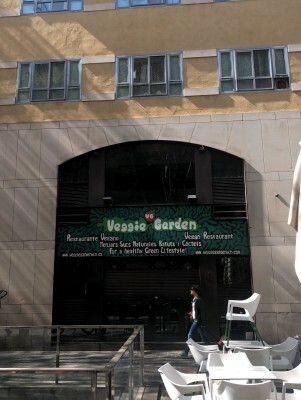 As it was the first place (Veganoteca) was closed for a few days, but the second was open and excellent – if you’re in town, try out the Veggie Garden. On the recommendation of some other British customers I had the Thali, a (rather early in the day) Caipirinha and a carrot cake, and went on my way full and recharged. Veggie Garden…I was a bit early! Back at the campsite I picked up Troopy and let Google navigate me South (avoid tolls/avoid motorways). A new game was born…listen to Google’s instructions and try and guess what on earth she was saying. Then, having given up, look at the screen and try and cross reference the sounds she was making with the printed street names. Then, give up and just go with the flow! In this manner I spent a few hours travelling down the coast…mostly built-up, quite run down with little islands of nature. I couldn’t help but think of the miles of coastline from the last trip and hope we don’t end up making the whole world like this. Between vast tracts of agri-industry and sprawling towns and cities, we haven’t left much of Europe for all those other species. You can see why certain developing countries might think we ought to do something about restoring our own back yard before telling them to stop cutting down their forests. Close to home, I have an antique map of Wiltshire which has the commentary (paraphrased from Olde Englishe) “they mostly burn wood for fuel, which the North of the county used to have in plenty”. Indeed…I guess we could burn rapeseed oil but its not great for biodiversity. Oh well – the citrus and olive trees are at least nice and green to look at. And another upside to the sunny but slightly chilly time of year, there’s no mossies! 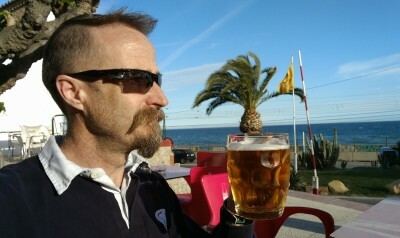 Next up…a dash down towards Almeria to meet Pete at the airport on Friday morning!